Pre-settlement time runs from the end of the glaciers, about 10,000 years ago, to the time when Europeans and Americans started to settle in what is now Michigan. During this time, there were many American Indians living along the shores of the Great Lakes and the major rivers. 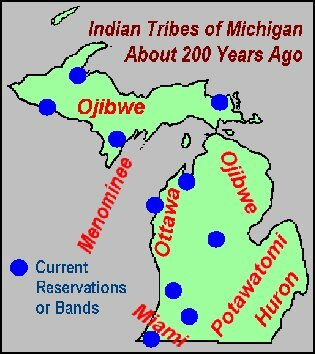 Ojibwe (Chippewas), Menominees, Ottawas, Potawatomis, Miamis, and Hurons were important peoples living in Michigan. And before them, there were the Woodland Cultures. These people came to Michigan for many reasons, including copper mining. Archeologists don't know a lot about them, but the Woodland Cultures left enough evidence to let us know they were here! Since the glaciers retreated from Michigan, there have been many kinds of forest and other vegetation types, including prairies. The climate changed several times during this period, sometimes much drier and sometimes wetter. The kinds of tree species and other forest species have changed, too. When the European and American pioneers began to settle Michigan in greater numbers, much of the forest was "ripe" enough to be very important to the growing towns and cities. Michigan forests around the 1600s to the middle 1800s were similar to what they are today. However, there were some important differences. Most of Michigan was covered in forest back then. Today, a little over half of Michigan is forested. Agriculture and cities are the main reasons why our forest area has shrunk. However, over the last couple decades, the area of Michigan forest has begun to increase. Many of the trees were larger and there used to be more pine, tamarack, hemlock, and some other tree species. And, there were fewer aspens, red maple, and paper birch than there are today. The famous stands of white pine were critical in the settling of these territories. A good example of one of these "pine groves" can still be seen at Hartwick Pines State Forest near Grayling, although it is getting old. Not all the forest was covered with huge pines, however. Most of the forest was probably similar to what we see today. Fire and wind kept much of the forest in a young condition. Forest scientists are discovering just how important these disturbances were to the forest condition and ecology. Before settlement began in a big way, Europeans and Americans (from the first states) travelled along the shores of Michigan for many years. The first explorers were men such as Etienne Brule, Father Jacques Marquette, Louis Joliet, Robert LaSalle, and Antoine Cadillac. They came in the 1600s but were not much interested in the forests. Many French Voyageurs passed through the region looking to send furs back to Europe. The first towns in Michigan were Sault Sainte Marie and Saint Ignace, started in 1668 and 1671. But most of the towns didn't get going until the 1800s. People didn't become interested in trees and lumber until the 1800s. Michigan was part of the Northwest Territories, organized in 1805. In 1837, Michigan became a State. By then, new cities were beginning to grow along the Great Lakes. It was time to log the forests. Click HERE to return to the Michigan forest history home page. Click HERE to return to the tree ID home page.